The BJP is yet to announce the names of any of its candidate for the seven parliamentary seats. 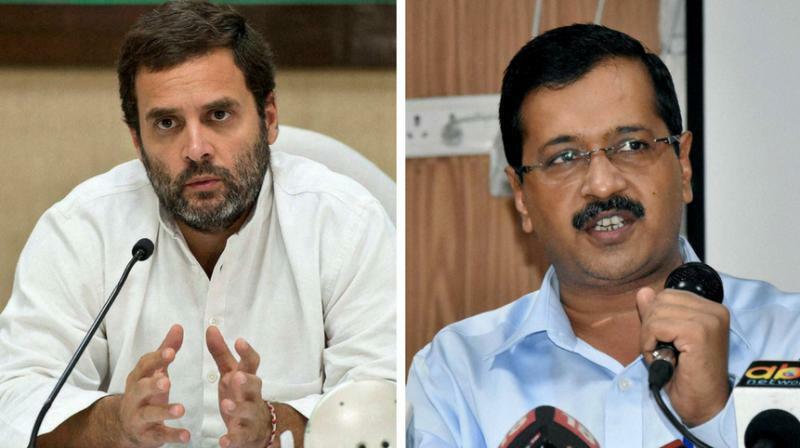 New Delhi: Ending days of confusion over his party’s stand on the AAP-Congress allia-nce for Lok Sabha elections in Delhi, Congress president Rahul Gandhi on Monday put the ball in Aam Aadmi Party supremo Arvind Kejriwal’s court with a tweet suggesting that the tie-up was being delayed by AAP’s indecision. Almost immediately the Delhi chief minister reacted sharply, saying that it was the Congress which didn’t seem serious about the alliance and was actually helping the Bharatiya Janata Party by splitting the anti-Modi vote by not aligning with parties in Uttar Pradesh and elsewhere. This is the first this when Mr Gandhi has spoken on the party’s attempts at forming an alliance with the AAP though Mr Kejriwal has repeatedly needled the Congress over it. Mr Gandhi has offered four of the seven Lok Sabha seats in Delhi to AAP. In the continuing bargain process between AAP and Congress, the former has asked for an alliance in 33 Lok Sabha seats in Delhi, Punjab, Haryana and Goa. If Mr Gandhi’s 3:4 seat sharing formula works out between the Congress and AAP, sources say then the Congress is likely to field former Union ministers Ajay Maken and Kapil Sibal from New Delhi and Chandni Chowk Lok Sabha constituencies respectively. The Congress may also field its state unit head and three-time chief minister Sheila Dikshit’s trusted lieutenant Raj Kumar Chauhan, who was also her Cabinet minister, from the North West Lok Sabha seat. Since the AAP has already announced the names of its seven candidates, the party may have to withdraw Pankaj Gupta from Chandni Chowk, Brajesh Goel from New Delhi and Gugan Singh from North West. Other AAP candidates likely to contest are Atishi Marlena from East Delhi, Raghav Chadha from South Delhi, Dilip Pandey from North East and and Balbir Singh Jakhar from West Delhi. The BJP is yet to announce the names of any of its candidate for the seven parliamentary seats. The last date for filing nominations is April 23. Mr Kejriwal had, on Sunday, softened his tone and said that his party will do anything to save the country from Prime Minister Narender Modi and BJP chief Amit Shah. But now Mr Gandhi has directly blamed Mr Kejriwal for putting roadblocks in the talks process. AAP leader and deputy chief minister Manish Sisodia had recently said that his party was ready to form an alliance with the Congress in Delhi, Haryana and Chandigarh but would not agree for a tie-up just in the national capital. In Punjab, AAP has four MPs and 20 legislators, but Congress (which rules the state) does not want to part with even one seat. In Haryana, Congress has a single MP but does not want to give any seat.